If you were using proxies before you installed Proxifier you should disable any built-in proxy settings. Your applications should then be configured to connect “directly” to the Internet (rather than through proxies). 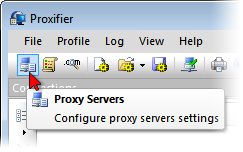 This will open a dialog window where you can add, edit or remove proxy servers and proxy chains used by Proxifier. If several proxy servers are specified, you can create a proxy chain. A proxy server will be displayed in bold if it is defined as the Action for the Default Proxification Rule. The order of the proxy servers in the list is not relevant. You can sort the list by address, port and type (protocol). The address of the proxy server can be a hostname or IPv4/IPv6 address. 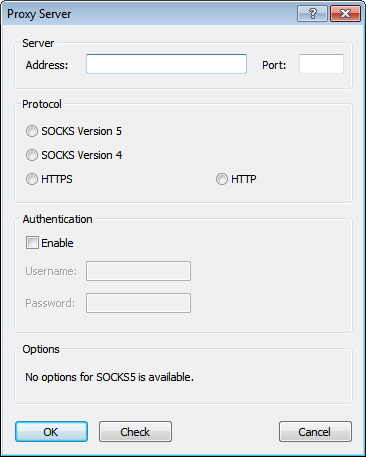 SOCKS version 4(A) — a widely used proxy server protocol that does not support authentication. You can specify only User ID. SOCKS version 5 — has more features than version 4 and supports authentication. You can specify a username and password. HTTPS — HTTP proxy with SSL support for arbitrary ports. Many HTTP proxy servers do not support SSL tunneling; therefore, they cannot be used as HTTPS. If an HTTP proxy works properly in the browser but fails in Proxifier, it most likely means that SSL support is unavailable. You can also check the proxy with the Proxy Checker tool. HTTP — the most common type of proxy servers. Unfortunately, such proxies can only be used for HTTP connections. You can enable this protocol at Profile->Advanced->HTTP Proxy Servers... Please make sure that you have read and understood the HTTP proxy servers topic before using this option! The options available depend on the proxy server protocol. User ID — used for the purposes of authentication. SOCKS 4A extension — allows remote name resolving (“DNS through proxy” feature) for SOCKS v4 proxy. Username and Password — user authentication. Appear as Internet Explorer 6.0 — if checked, Proxifier emulates browser’s environment and appears as Internet Explorer 6.0 (some firewalls deny all requests that do not come from a browser). Use NTLM — it is a widely used authentication protocol using encryption for secure transmission of login credentials. Use current user login — proxy authentication will be done with current user credentials. Also known as transparent NTLM authorization. You can check any proxy with the Proxy Checker tool using the Check button.